In February 2018, projections ranged from 5.9% from Mike Cowan to our 12% at Semiconductor Intelligence. Forecasts released in March to June range from Gartner’s 11.8% to our 16%. The latest forecasts average an increase of 5.4 percentage points from the previous forecasts. What has changed in the last few months? 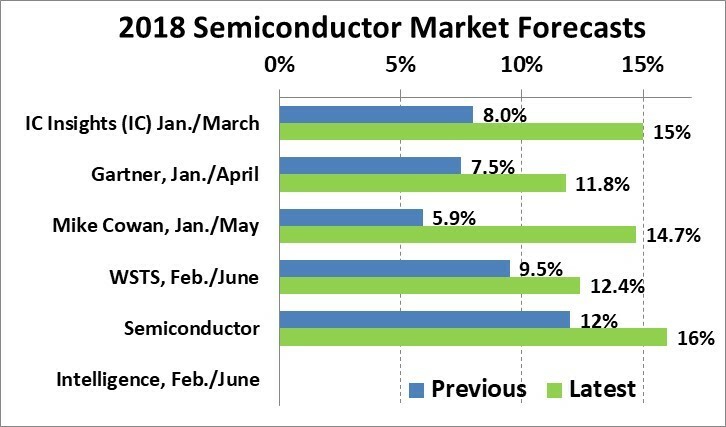 One factor is the first quarter 2018 semiconductor market was not as weak as expected. The first quarter is the seasonally weakest and is usually down from fourth quarter of the previous year. In the last five years, the first quarter has been down four times, three times declining 5% or more. 1Q 2018 declined only 2.4% from 4Q 2017. The memory market accounted for most of the 21.6% semiconductor market growth in 2017. Memory grew 61.5% while the rest of the market grew 9.9%. The memory market remains healthy in 2018. The three major memory companies, (Samsung, SK Hynix and Micron Technology) all report a continued strong DRAM market. The three companies see some softening in the market for NAND Flash, but do not expect significant declines. 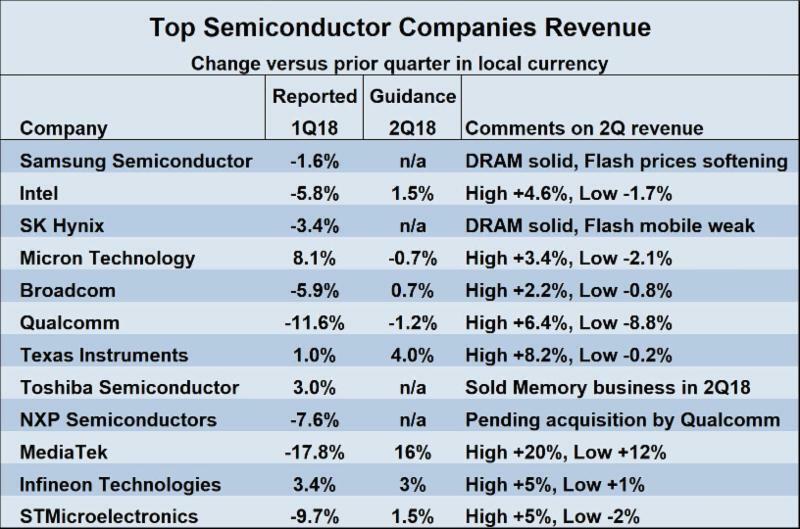 The major semiconductor companies are cautious in their revenue guidance for 2Q 2018. Guidance ranges from a decline of 1.2% from Qualcomm to an increase of 16% from MediaTek (bouncing back from a 17.8% decline in 1Q 2018). The high end of guidance ranges from Broadcom’s 2.2% to MediaTek’s 20%. The overall outlook for key electronic equipment has not changed significantly from early in 2018 to recently. 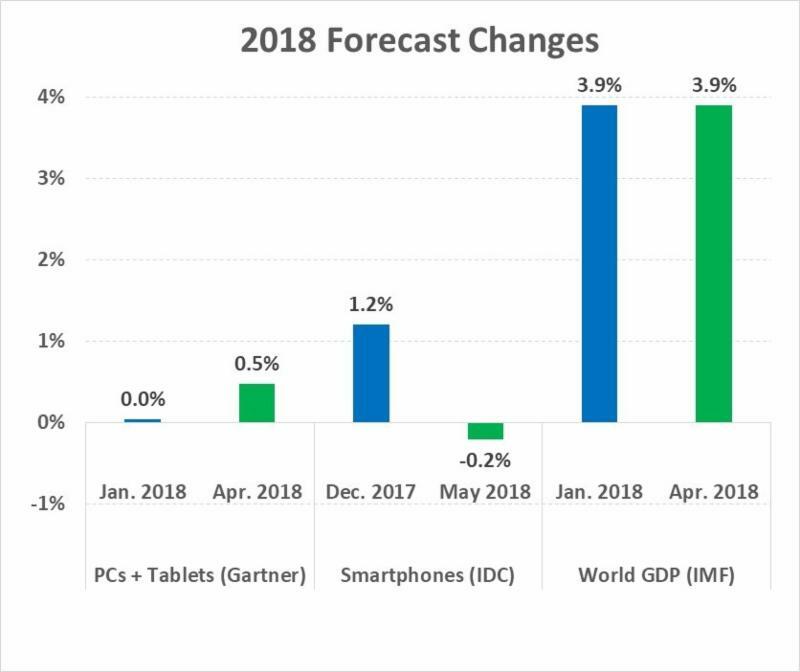 In January, Gartner projected the combined unit growth of PCs and Tablets in 2018 would be 0%. In April, Gartner revised the number up slightly to 0.5% – not a significant change. In December 2017, IDC expected smartphone units would increase 1.2% in 2018. In May, IDC revised it to a decline of 0.2%. Again, not very significant. The International Monetary Fund (IMF) has kept its projected 2018 GDP forecast at 3.9% growth, unchanged from January to April. The increased optimism for the semiconductor market in 2018 can primarily be attributed to the memory market continuing strong, not weakening as many expected. There is still the possibility the memory market could collapse in the second half of 2018. However, we at Semiconductor Intelligence believe the most likely scenario is a softening of the memory market, not a collapse. Moderate quarter-to-quarter growth for 2Q 2018 to 4Q 2018 supports our 16% annual forecast.